In a departure from an earlier report that suggested that Anthony Barr was signing with the New York Jets, it is now being reported that the sixth-year linebacker has agreed to terms to remain with the Minnesota Vikings. 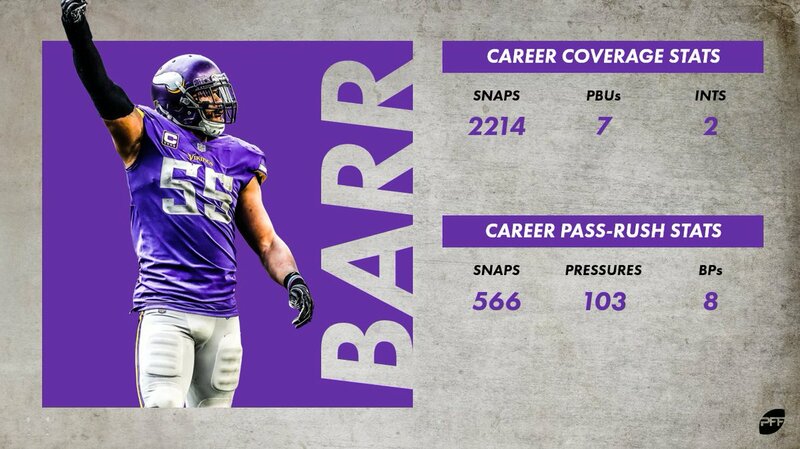 Barr has played 71 games (all starts) and over 4,500 snaps with the team, and will now reportedly look to continue his career in Minnesota. Drafted with the defensive-minded Mike Zimmer’s first pick as the Vikings head coach in 2014, Barr was an immediate starter for a defense that ranked dead last the previous season in points per game (30.0) and made an impact that season as both a linebacker in space and as a pass-rusher, helping them reduce that number by over eight points per contest (21.4) while generating 20 total pressures and 33 stops. His rookie year was highlighted by a game-winning strip and recovery of Tampa Bay’s Austin Seferian-Jenkins that he himself returned for an overtime touchdown for Minnesota’s first win and only win in Tampa since 1997. Barr’s career trajectory, and that of the Minnesota defense, appeared to be skyrocketing in 2015, when Barr was the second-highest-graded player at his position (89.6), and he helped the Vikings reach the playoffs while generating 27 pressures, 41 stops, an interception, and two pass breakups. Barr could not build on that pace in 2016, when he struggled to a 50.5 grade (87th among linebackers), and while he improved in 2017 (63.7 grade) and 2018 (71.4), he was never as productive or healthy as he was during his 2015 breakout campaign. After five full years in the NFL, his contributions have accounted for roughly one total win above replacement, which is roughly what you should expect from a non-quarterback taken with the ninth pick of the NFL draft.